The 2017 Gallup Poll, Engaged Today – Ready for Tomorrow, showed that less than 50 percent of students are actively engaged in the learning process at school. Research has shown that when students are actively engaged in the learning process, they are more likely to understand and retain the content we are trying to teach them. As teachers, we would ultimately want 100 percent of our students engaged. Here are a few ideas to make sure your students are actively engaged in learning! There is nothing more boring to a student than having to sit still in their desk listening to a lecture. Furthermore, studies have shown that students’ brains learn best and retain more when the body is active. One way to incorporate movement in your lessons is by using gestures or hand signals to represent key pieces of the content. For example, you might have students model acute, right, obtuse, and straight angles using their arms. Games are another great way to keep students up and moving as they practice content. One game that can be used to review materials is “trashketball”. In this game, students can toss a piece of crumpled up paper into a trash can if they answer a question correctly. For example, if you asked them, “What is the definition of a right angle?” They would answer, “An angle that is 90 degrees. They increase their team’s score by successfully getting the paper into the trash can. A second game that can be used to practice skills is this math facts relay. A third way to get students moving is by using the room. Instead of handing out worksheets or task cards, post each question around the room and let students walk around to answer them. Write questions on balloons and disperse them through the room. Students pick them up and answer the questions on them. Let them pop the balloons at the end of the lesson as an extra incentive to participate. 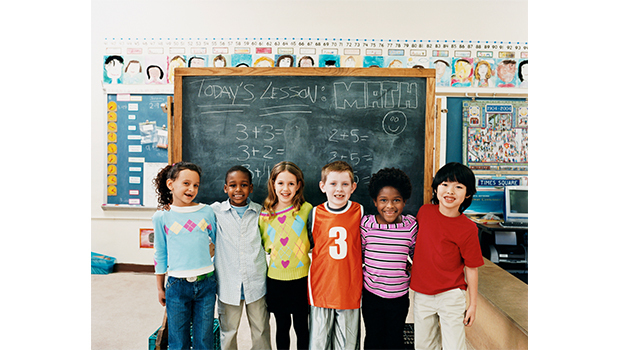 Did you know that the average elementary student has an attention span of under ten minutes? If you expect your students to pay attention to 20 or 30 minutes lectures without talking, moving or interacting, you will be sorely disappointed. The teacher should not be the only one talking – as you teach a lesson, stop periodically to have students interact either through response systems or with think-pair-share. Not only should the teacher not be the only one talking, make sure that a few students are not doing all of the talking. We have all been in a classroom where a handful of students raise their hands to answer every question. The other students often don’t even bother to do the work because they know these students will provide the answer for them. Don’t let this happen! Make sure everyone in the class is actively participating by using response systems such as white boards, hand signals, or these Student Response fans. You could also have students write down their answers before you call on students. Provide plenty of wait time to allow all students the opportunity to prepare their response. Making sure that your students are engaged in the learning will not only increase learning, but you will also find that you will be dealing with fewer discipline issues, and you will enjoy teaching even more! Teaching is a collaborative sport! Please share comments below so we can all grow! What strategies do you use in your classroom to keep students engaged?